The SMP Indicator for temperature, 0-10 V, 4-20 mA, speed and potentiometer is a very flexible digital indicator and display system in a wall or surface mounting format, for use with a wide range of sensors and transducers, including volts, amps, temperature, frequency, speed, load, force, pressure, torque, LVDT, RVDT and many more. The digital architecture of the SMP offers very easy one-pass calibration and fast setup. This versatile device offers options of isolated analogue outputs, latching relays or digital outputs for control or alarm functions. 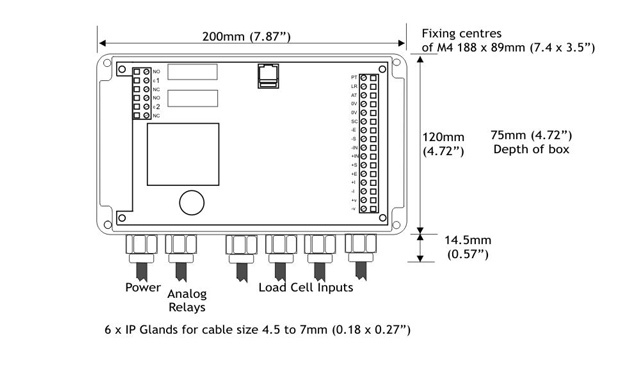 For a wireless telemetry version, see models T24-SO and SERIALDIS Radio Telemetry Display Module. Drive 4-20mA up to 1Kohm and 0-10 volts up to 2mA. Accuracy 4-20mA + 0.15% of range, typical. 0-10V ±2% before calibration. Isolation ±130V RMS or DC max to analogue input or any other port. function(s) Watchdog timer giving repeat auto resets. Impending power detection and hold off. Keypad security and time out. The SMP is a PCB with CPU and Analog Outputs 4-20mA/O – 10V which can be either ABS Cased or Din Rail mounted. Starting with the Base Unit select the SMP you require followed by the options you need to configure the device to meet your needs.